Hello friends! 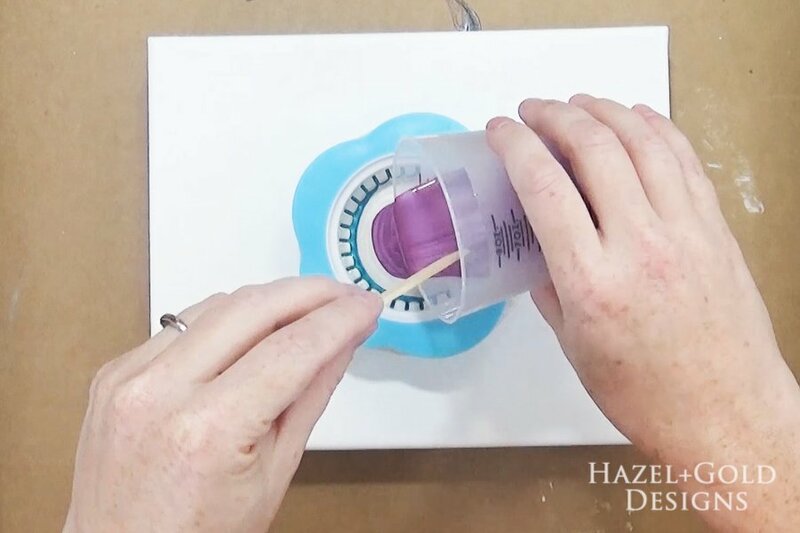 I’m sure some of you have seen the paint and resin pouring project videos all over the internet, but it’s not always easy to see how they did it. Well, I’m here to show you that today! 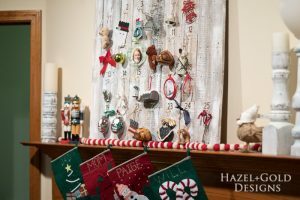 I’ve teamed up with my dear blogging friend Our Crafty Mom to share with you a series of artwork you can make for your home. 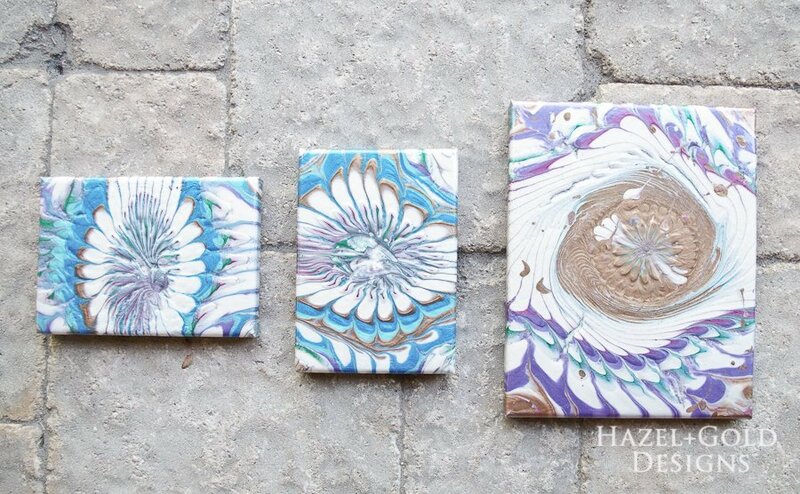 This month we decided to share a paint pouring! 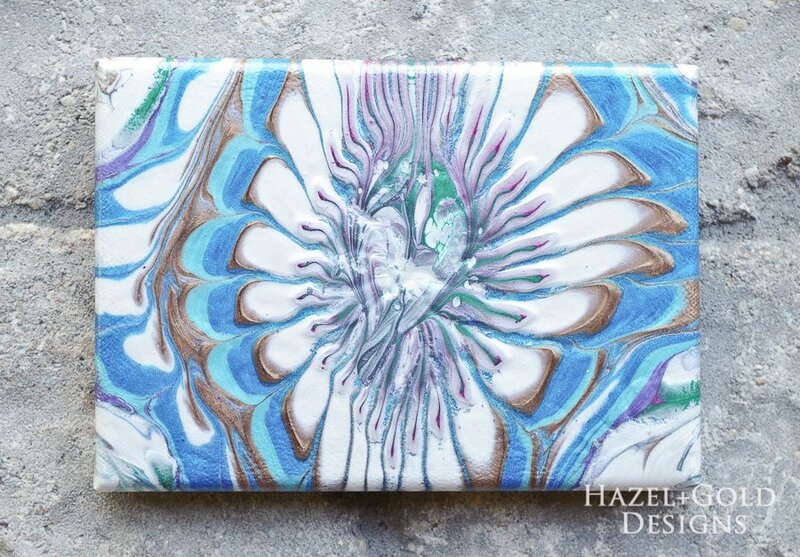 I’ve created two different paint pours for this post. 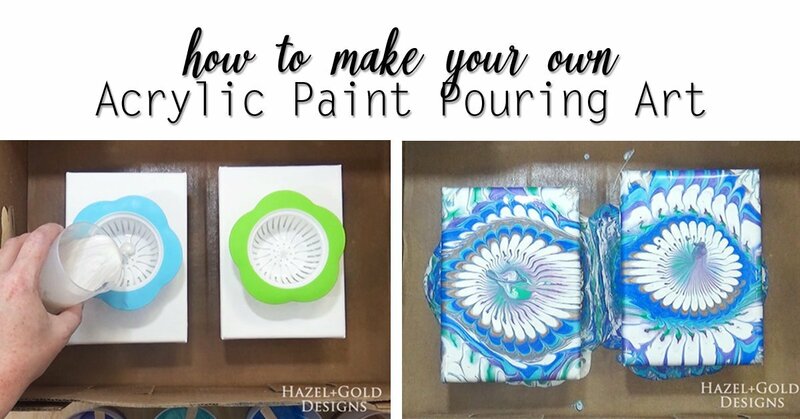 I also share some tips and ideas along with all the details on how to make your own poured paint artwork! I hope you find it helpful. 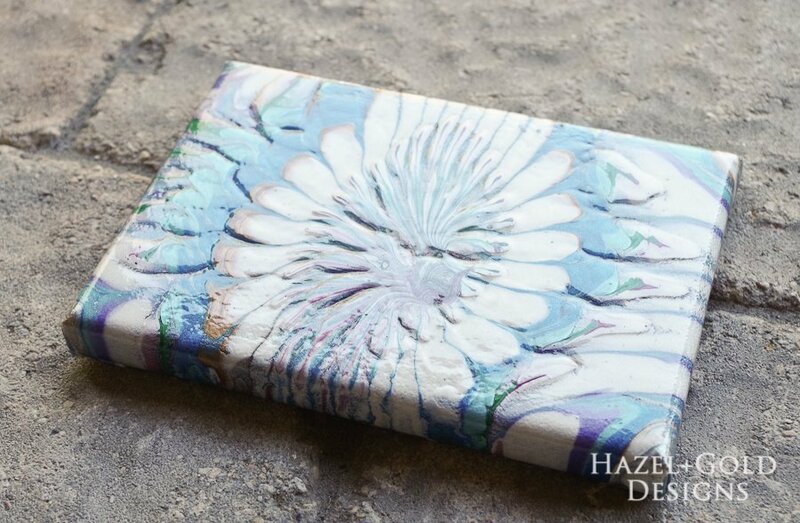 If you’re looking for details on pouring resin, check out my DIY Poured Resin Wall Art tutorial as well! 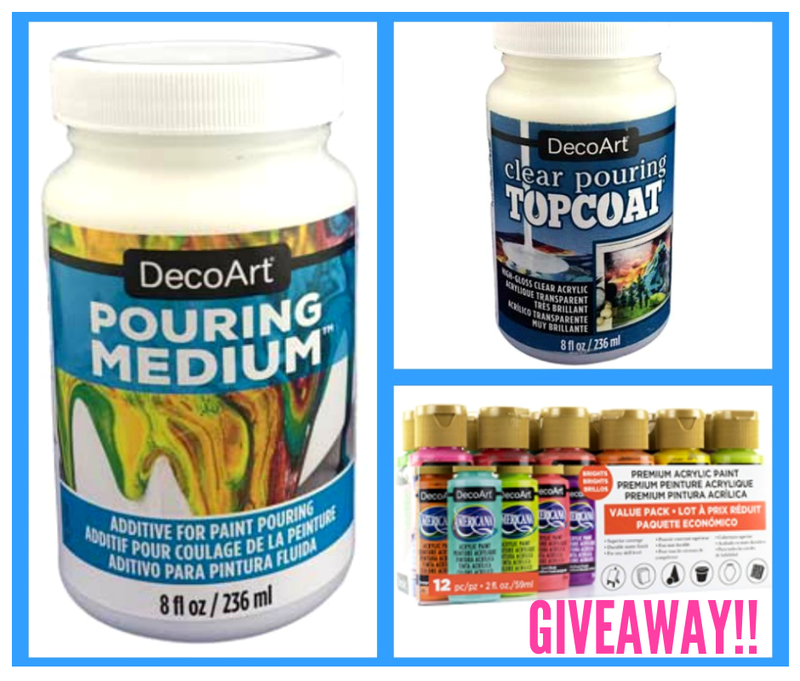 Oh and we have a giveaway sponsored by DecoArt!!! Details can be found at the bottom of this tutorial! 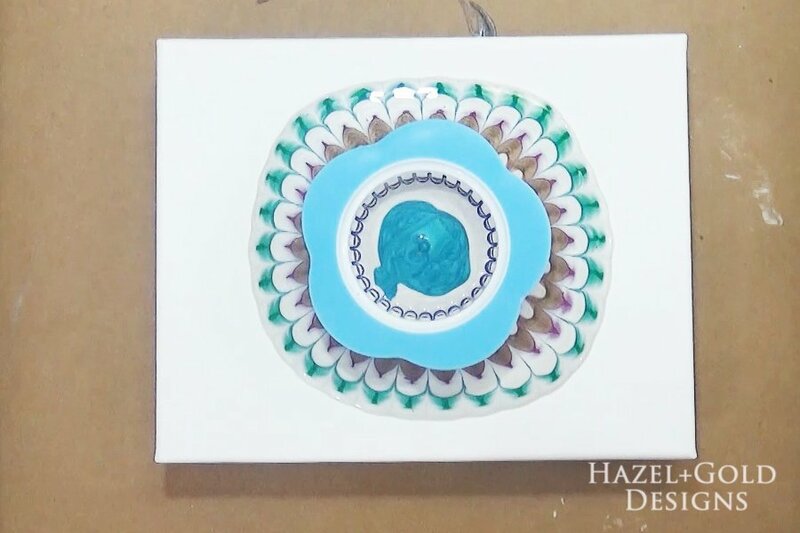 This project was created using free product from DecoArt. 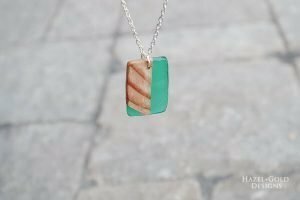 There are also affiliate links throughout this post, which means that if you make a purchase after clicking one of those links, I get a small commission at no extra cost to you. 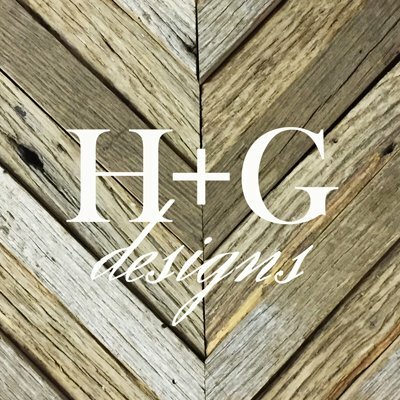 I only recommend products I trust and always give you my honest feedback after using them. For more info, check out my Disclosures page. The full written tutorial and instructions are below. 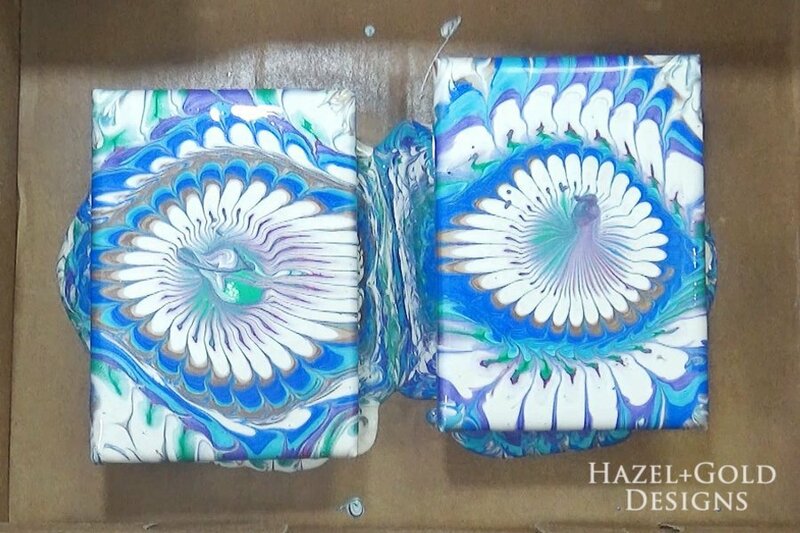 If you want to watch the paint pouring in action, check out this video! Don’t forget to Subscribe to my YouTube Channel also! 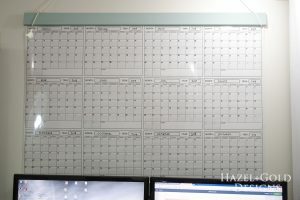 The first step in this project is to stick push pins into the back of the canvas frame. 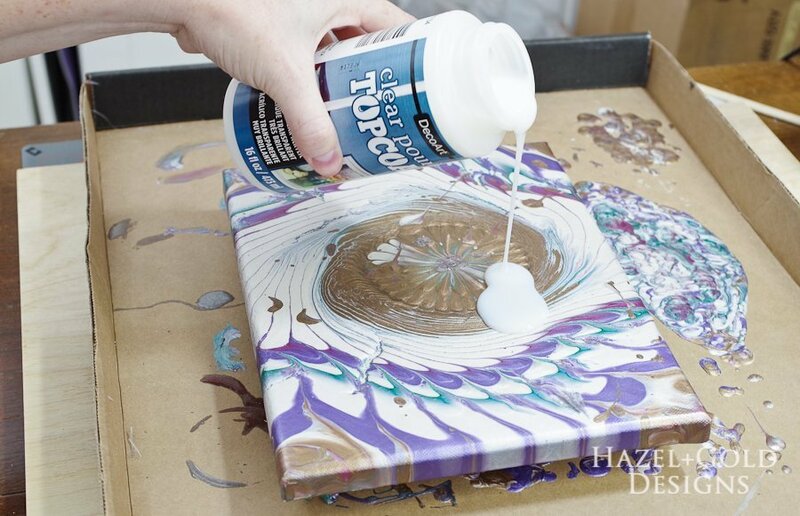 This will elevate the canvas so it doesn’t get stuck to the box after you pour the paint. 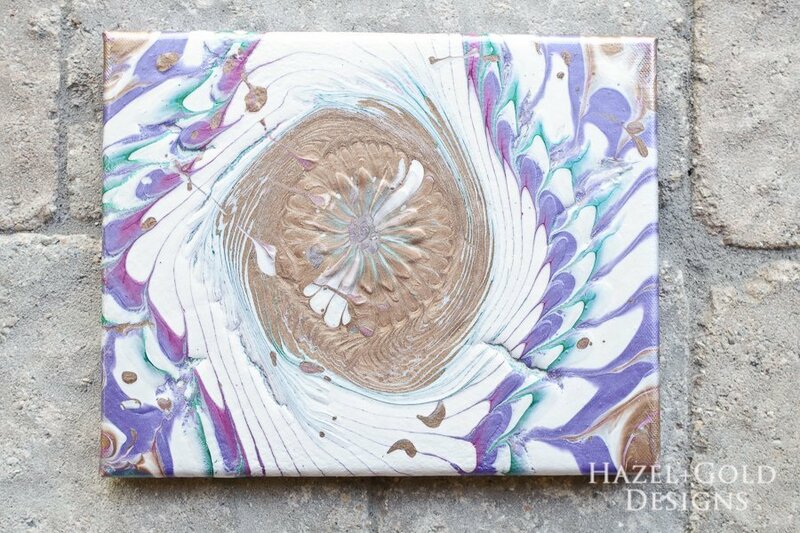 For this project we’re going to use DecoArt metallic and Extreme Sheen paints and the DecoArt Pouring Medium. This medium thins that paints so that they are pourable. 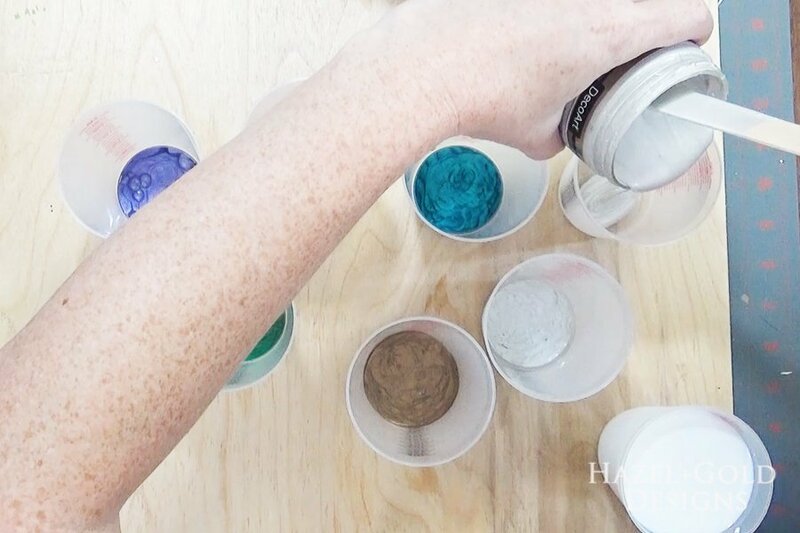 Put about an ounce or two of paint into each cup. 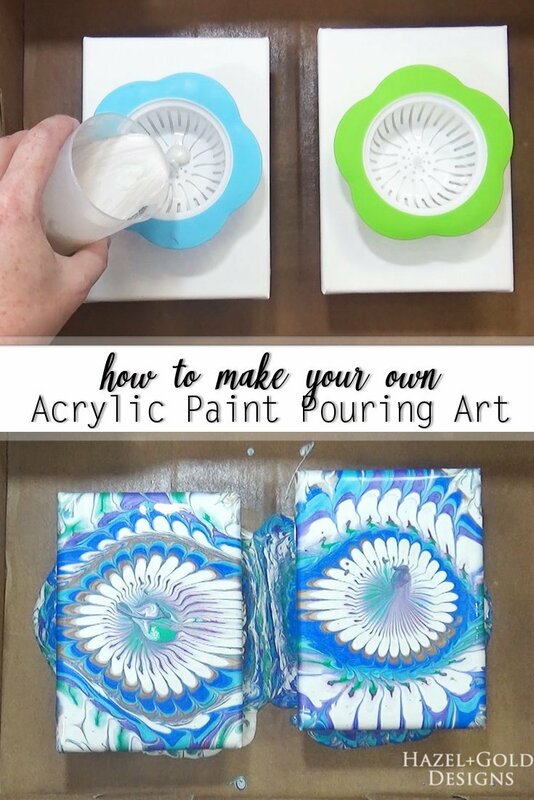 Also, pour some of the pouring medium into a cup so it will be easier to add to each cup of paint. 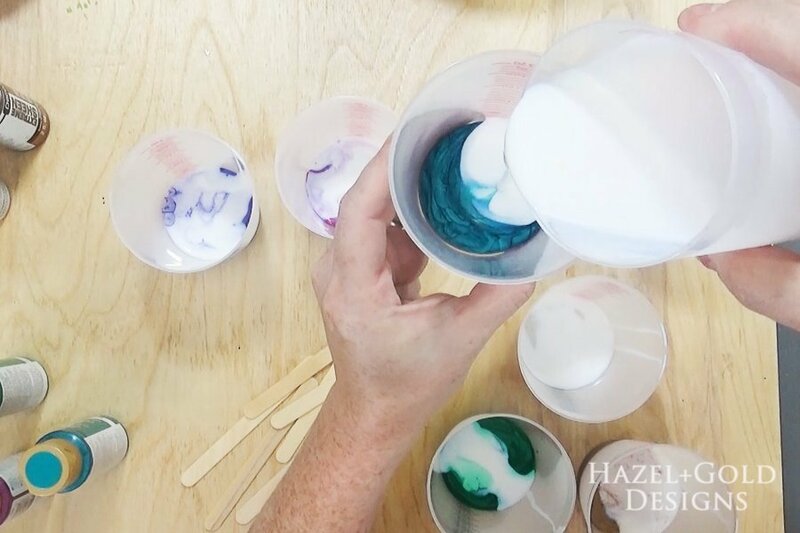 Add pouring medium to each color. 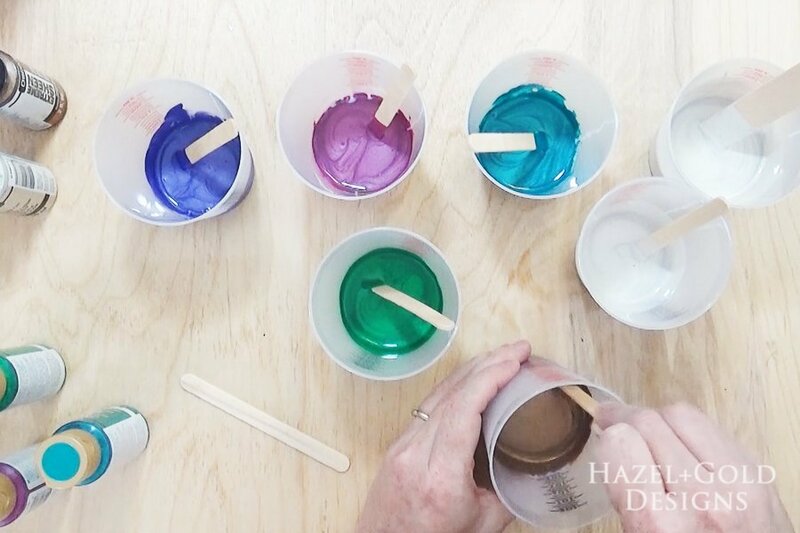 The amount will depend on what viscosity you want your paint to be. 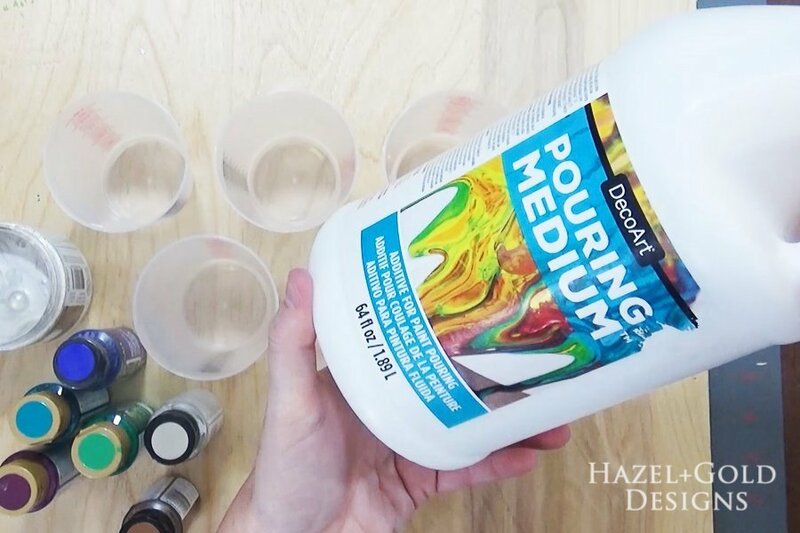 The exact instructions are on your bottle of pouring medium. This is the sink strainer I used. 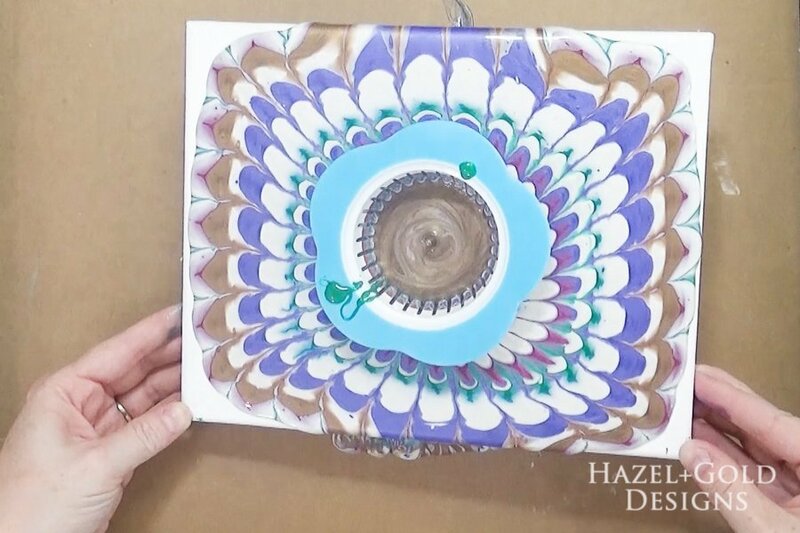 If you are making a larger painting then you could use something similar, like a colander. 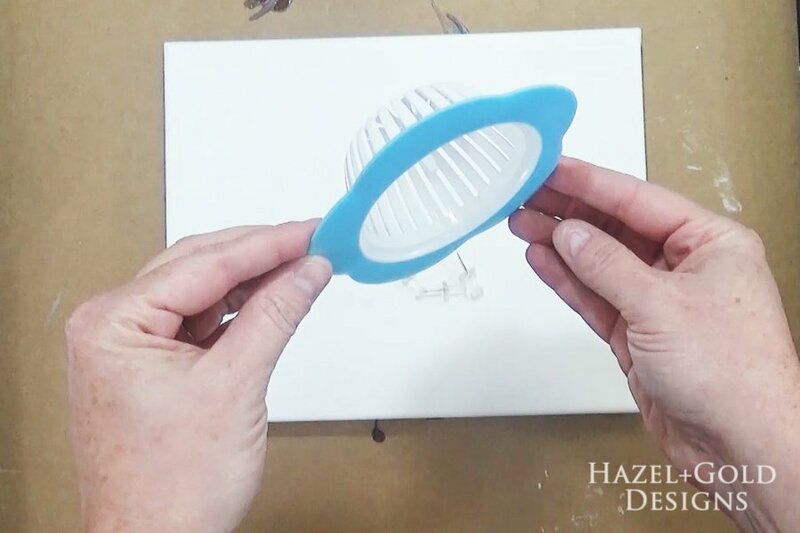 Place the sink strainer into the center of your canvas. 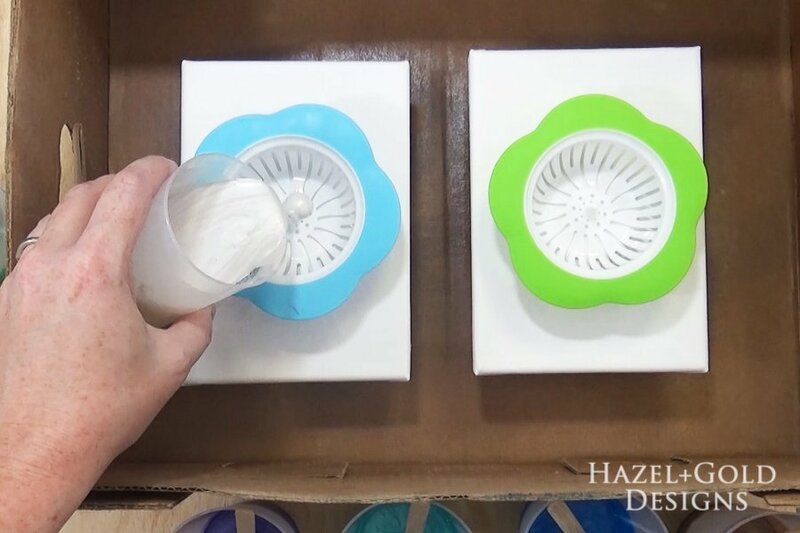 Begin pouring a little bit of each color into the center of the strainer. The order of colors is just personal preference. As the paint begins to spread out it will create a really cool design! 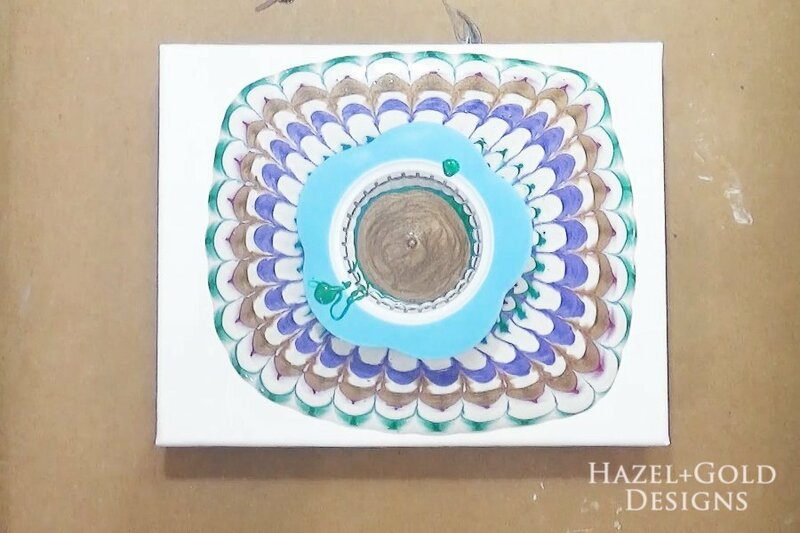 If you previously covered your canvas in white paint like the tip above explains, then just pour until your design looks the way you want it. It’s so fun to see how the different colors make different types of lines too. 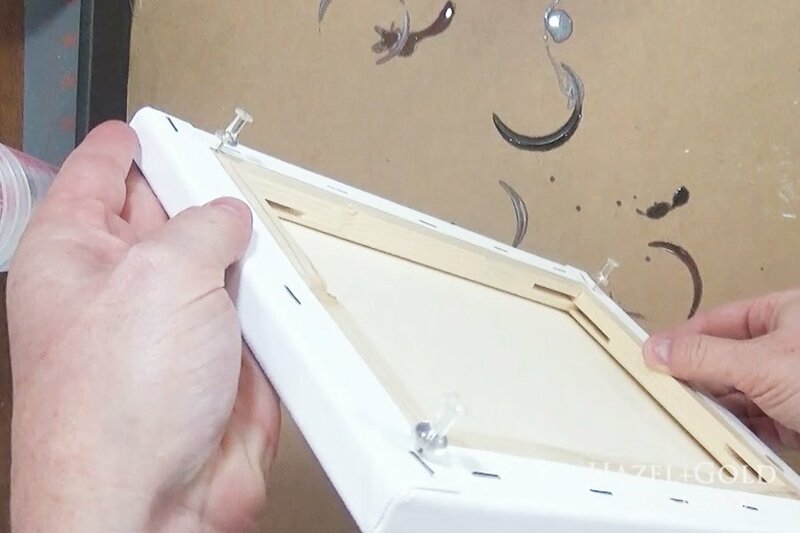 Okay, if like me you did not cover your canvas in white, then you will probably have to tip your canvas slightly to get the paint all the way to the corners. As you can see in the photo below, tipping it distorts the design somewhat. I happen to think it still looks pretty cool. I ended up tipping mine in a circular motion so all the paint colors swirled. It looks neat! Once you’re done, get ready to remove the strainer. 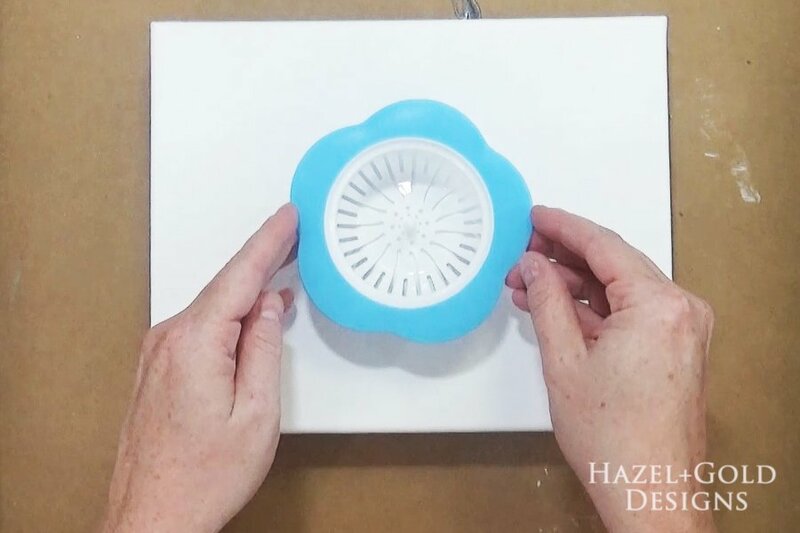 **TIP TWO: Remove the strainer quickly and have a cup close by to put the strainer over so it doesn’t drip back onto your painting. I learned this the hard way as you’ll see. I did better in the second pour below! Since I didn’t remove my strainer fast enough, it dripped gold paint on part of the canvas, so I took the strainer and dripped gold over the entire thing. But, made a note to be faster about it next time! Let your paint dry! 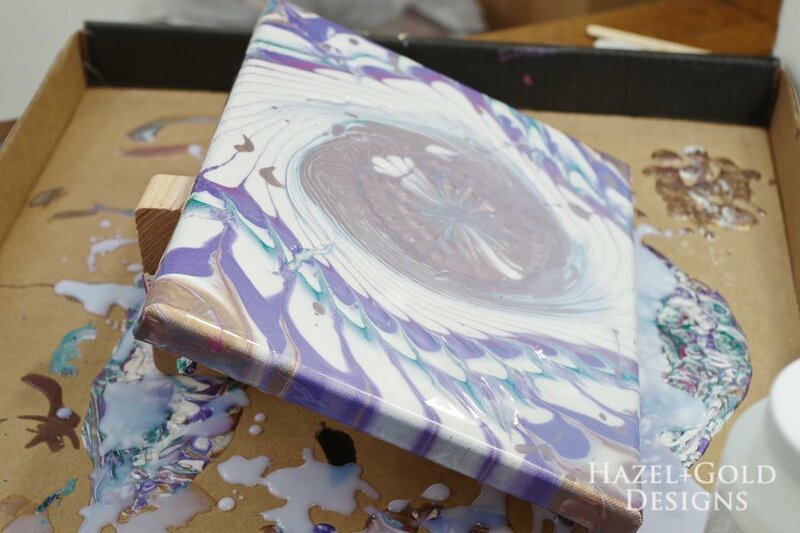 Once it is completely dry, we’ll add the Clear Pouring TopCoat to it to create a protective and glossy finish! 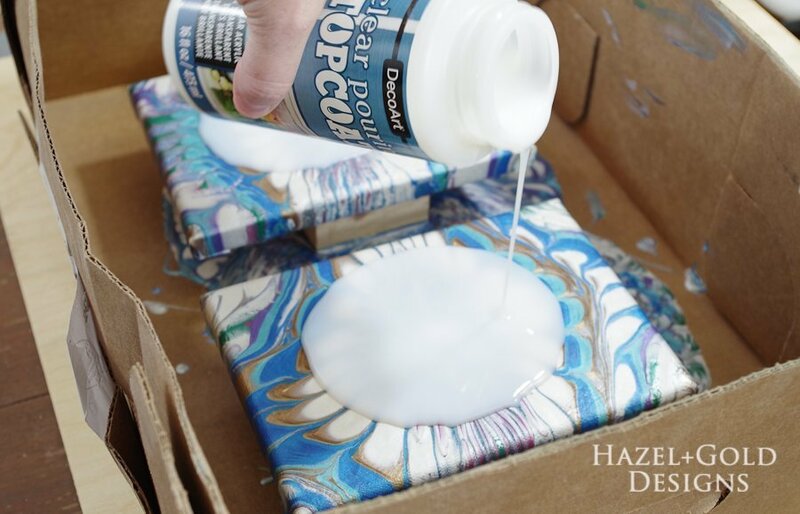 Pour the TopCoat straight onto your dry painting until it is covering all but a few inches from each edge. Tip your canvas to get the TopCoat to spread across the entire thing. 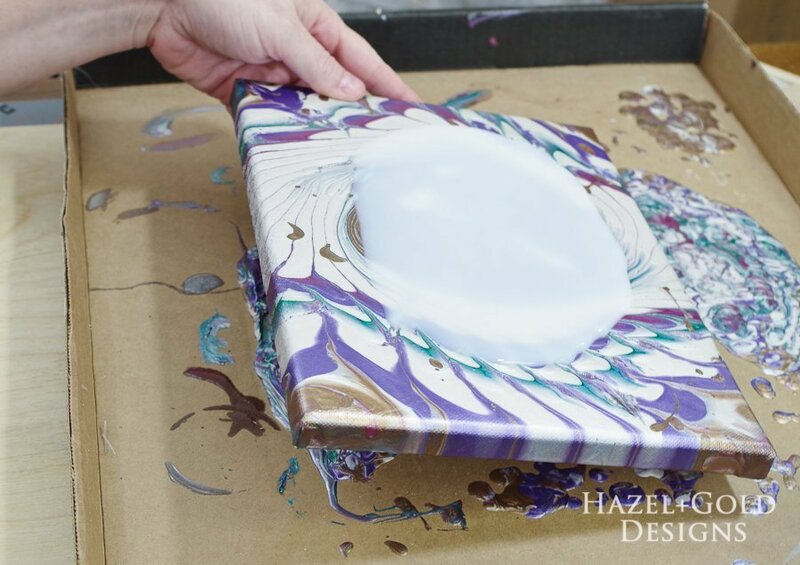 Once it is completely coated, lean it at an angle so the excess can drip off and let it dry. If you want a second coat, repeat this process but lean it the opposite direction the second time. And there you have it! 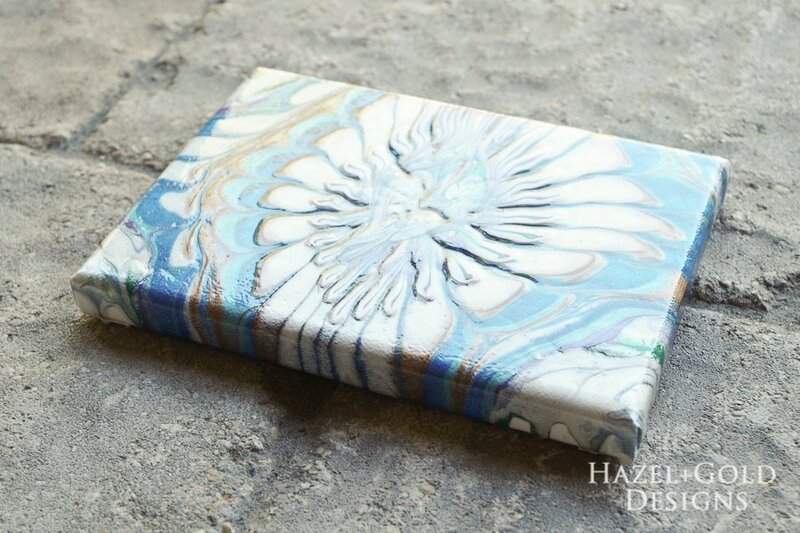 A gorgeous piece of DIY Acrylic Paint Pouring Art! Alright, I wanted to try a second pour to show how differently they can look! 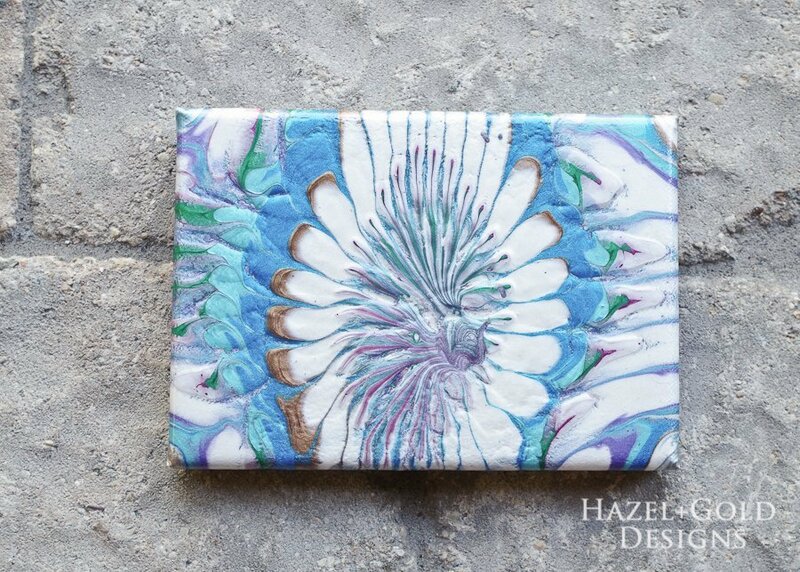 For this pour I used to smaller canvases. Using the exact same method as above, I created these two beautiful pieces! Again, once it is dry, cover it with the Clear Pouring TopCoat. 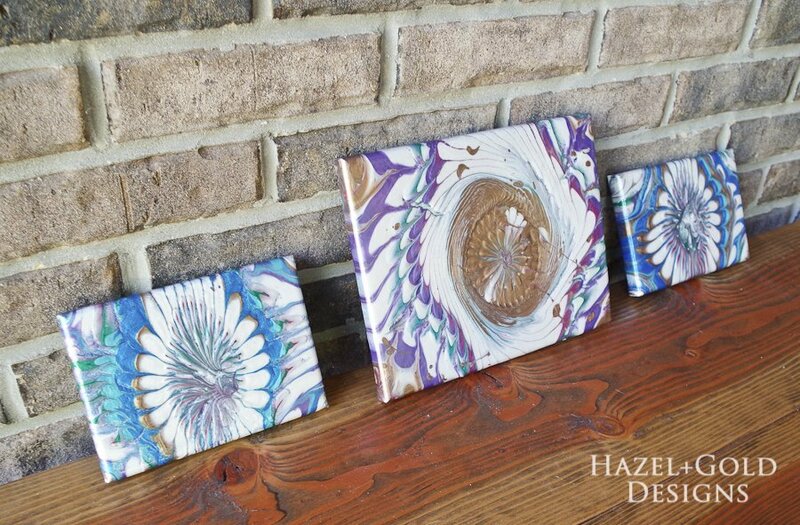 Once that is dry, you have three gorgeous works of art! It may be hard to tell, but these two photos show how shiny that TopCoat is; I was really impressed! What do you think? Would you try this technique? Thanks for reading. Please share this tutorial on social media or save the next image to Pinterest so you don’t lose it! 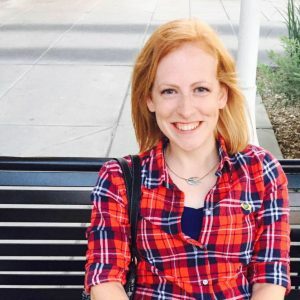 I’d love to hear what you think in the comments as well! 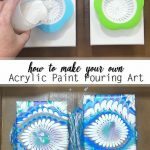 I love this method, this is the first time I have seen paint pouring. I can not wait to give it a try. Thank you for the great information and instructions.